I've started from scratch, deciding to make it more object-oriented. 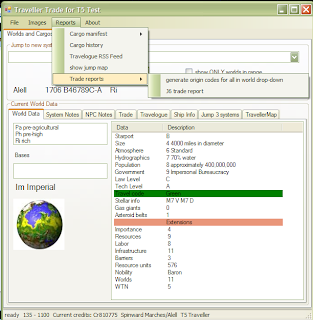 The new version supports classic Traveller, T5 & Mongoose Traveller. It uses a ship config file that contains the info to run the program, so you could test the same ship in each version to see how they stack up. The interface is a bit different (and sorry - I am no UI expert). It uses basic CSV & XML files - no hidden database. Not sure about releasing it yet - I've a copy stashed on-line that does not contain all the data in the tables, but I am unsure of copyright issues. Anyway - lots of work went into this, but it is still not done. So if someone asks real nicely for a release?